숭릉(崇陵)은 조선 18대 현종(顯宗)과 명성왕후 김씨(明聖王后 金氏)의 능으로 구리 동구릉에서 네 번째로 조성된 능이다. 능의 형식은 같은 언덕에 왕과 왕비의 봉분을 나란히 조성한 쌍릉(雙陵)이다. 정자각은 ‘丁’자형 평면의 건물로, 제향(祭享, 제사)을 지내는 건물이다. 현종이 세상을 떠난 1674년(숙종 즉위)에 건립되었다. 숭릉의 정자각은 조선왕릉 40기 중 유일하게 남아 있는 팔작지붕 형태로 정전 5칸, 배위청 3칸으로 구성된 8칸의 정자각이다. 기존의 5칸 정자각이 아닌 8칸 정자각이 나타나게 된 것은 영악전(靈幄殿)의 기능이 정자각에 흡수되면서 정자각의 규모가 커졌기 때문이다. 영악전은 왕릉 내에 재궁(梓宮, 왕과 왕비의 관)을 임시로 모시는 건물로, 건물의 크기는 재궁을 넣어두는 찬궁(攢宮)과 의례를 위한 각종 기물의 배치에 영향을 받아 정자각보다 크게 만들어졌다. 그러나 1673년부터 1674년까지 효종 영릉(寧陵)의 천릉(遷陵)과 효종 왕비 인선왕후의 국장, 현종의 국장을 연속해서 치르게 되자 왕릉 공사에 드는 재정이 어려워지고 백성들에게 끼치는 폐해가 커졌다. 이에 현종의 능을 조성할 당시의 왕인 숙종은 왕릉 공사를 축소하였고 그 일환으로 영악전을 만들지 않고 정자각이 그 기능을 흡수하게 하였다. 『산릉도감의궤』 등 문헌에 의하면 세종 영릉(英陵), 명종 강릉(康陵), 인조 장릉(長陵), 효종 영릉(寧陵)의 정자각이 팔작지붕이었으나, 후대에 모두 맞배지붕으로 교체되어 현재는 숭릉의 정자각만 팔작지붕으로 남아 있다. 특히 『현종숭릉산릉도감의궤』에 기록된 정자각 건립내용이 현재의 모습과 큰 차이가 없는 것으로 보아, 1674년 창건된 이래 규모나 지붕 형식이 크게 변형되지 않고 지금까지 유지되었다고 볼 수 있다. 따라서 숭릉 정자각은 변화된 17세기의 왕릉제도를 확인할 수 있는 귀중한 사례라는 점에서 역사적, 학술적, 예술적 가치가 매우 크다. 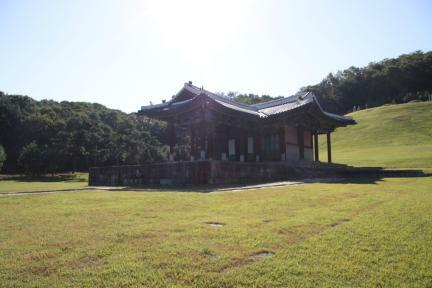 Sungneung, the Royal Tomb of King Hyeonjong, the 18th ruler of Joseon and his wife, Queen Myeongseong, is located near the west end of the East Nine Royal Tombs in Guri. Sungneung is a couple tomb with two separate mounds in a yard enclosed by a low-rising wall. 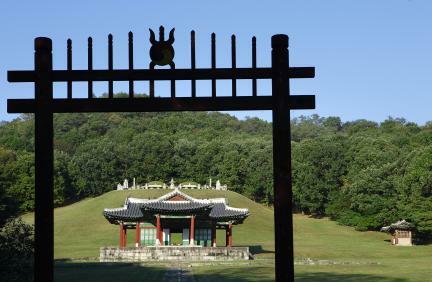 The burial mound with King Hyeonjong’s remains was constructed first, in 1674 (the first year of King Sukjong’s reign). 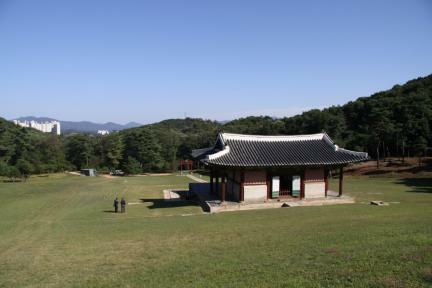 The burial mound of his queen consort was added next to his, ten years later, in 1684 (the tenth year of King Sukjong’s reign). The two burial mounds are fronted by a shrine and a stele pavilion. The south side of the graveyard is low in elevation and is, for this reason, frequently flooded, but the rest of the graveyard is at a safely high altitude. The shrine, removed from the red-spiked gate by some distance and built on a slope, is prominently visible even from afar. 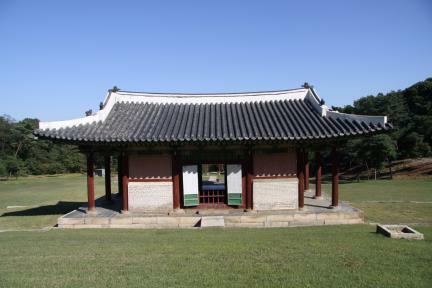 The shrine of Sungneung was built at the same time as the Royal Tomb of King Hyeonjong; in other words, in 1674. The shrine was repaired several times thereafter, and a woldae (stone terrace) is said, in Sunjo sillok (Annals of King Sunjo), to have been built in 1828 (the 28th year of King Sunjo’s reign). 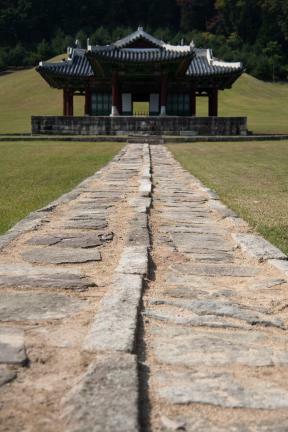 The last recorded repair, dated 1879 (the 16th year of King Gojong’s reign), was that of its stone steps. The shrine is surmounted by a hipped-and-gabled roof, which became the norm since the shrine of Jangneung, the Royal Tomb of King Injo. The latter was a five-kan (the space between two columns, one kan being 2.5m) building with the main worship room consisting of three kan and the two side rooms together measuring two kan. 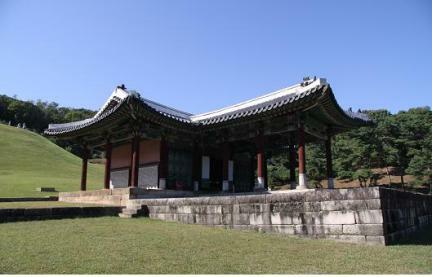 The precedent was followed by the shrine of the Royal Tomb of King Hyojong, also located in the East Nine Royal Tombs. 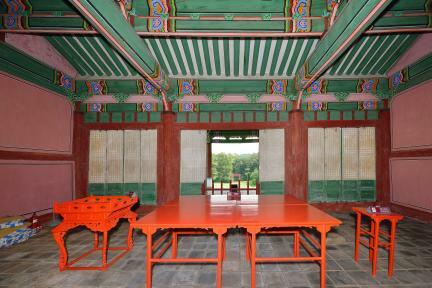 In 1673 (the 14th year of King Hyeonjong’s reign) when Yeongneung, the Royal Tomb of King Hyojong, was relocated to Yeoju, the shrine was expanded to the width of eight kan (five kan for the main worship room and three kan for the two side rooms). The roof was kept in the hipped-and-gabled style. 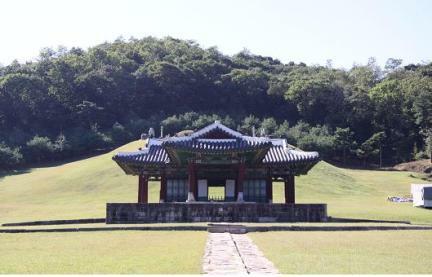 In Hyeonjong salleungdogam uigwe, the record on the construction of the Royal Tomb of King Hyeonjong compiled subsequently, one reads that when Sungneung was constructed in the East Nine Royal Tombs, in 1674 (the first year of King Sukjong’s reign), its shrine was modeled on that of Yeongneung Royal Tomb. Meanwhile, Hyojong yeongneung cheolleung dogam uigwe records that when Yeongneung was relocated, the shrine was rebuilt using the shrine of Gwangneung Royal Tomb as the model. 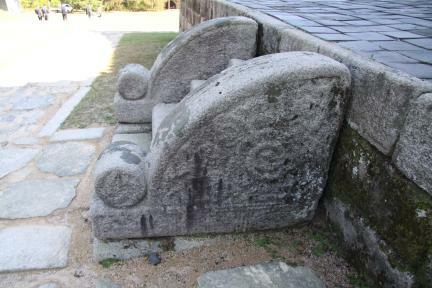 The shrine of eight kan size were constructed continuously since Gwangneung, in graveyards including Seolleung, Jeolleung, Hyoreung, Gangneung, and Jangneung Royal Tombs. The shrine of Yeongneung, Sungneung, Myeongneung Ingneung, and Uineung were also eight kan in size. The apparition of eight-kan shrine is at times explained by the disappearance of Yeongakjeon and transfer of its functions to the shrine. 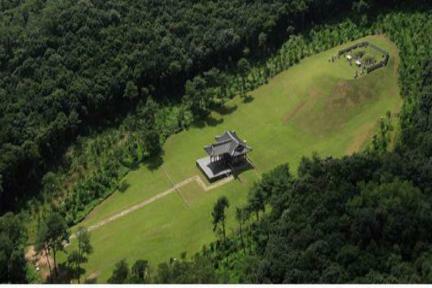 Surviving eight-kan shrine include the ones in Ingneung, Hwireung and Uireung Royal Tombs. 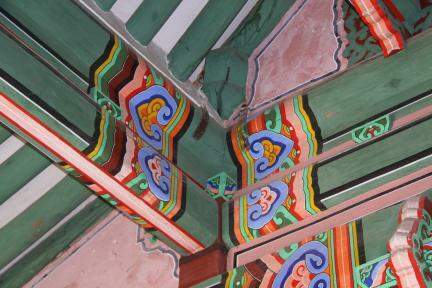 But, all other shrine, except the one in Sungneung, are surmounted by a gable roof. 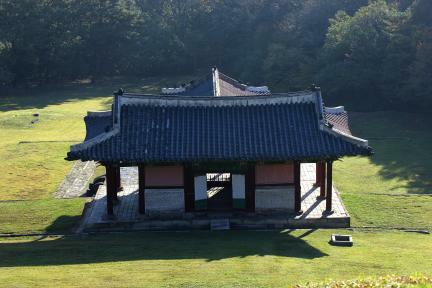 The shrine of Sungneung is the only of forty-two buildings of its kind (forty in South Korea, two in North Korea) with a hipped-and-gabled roof and is eight kan wide (five kan occupied by the worship hall and three kan by two side rooms). The columnar bracket system consists of one bracket arm and two brackets for the worship room, and two brackets without a bracket arm for the two side rooms. Although the size was expanded to eight kan, the building appears well-proportioned. The only hipped-and-gabled roof shrine of eight-kan size, the shrine of Sungneung has been mostly preserved in its original state ever since its construction in 1674, both in its roofing style and size. As an important example of a 17th-century shrine, this building is of great historical, academic and artistic significance.